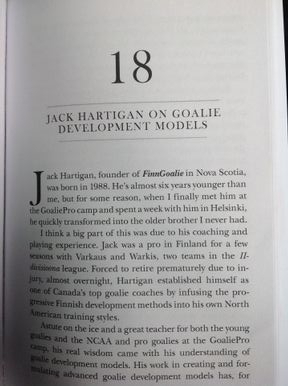 Loaded with science, research, personal experiences, and numerous interviews with some of the world’s finest goalie coaches, "Between Two Worlds" provides goalie enthusiasts of all ages and backgrounds with a variety of unique perspectives on the current state of goalie development. 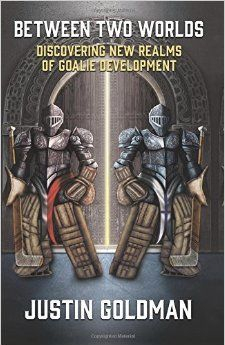 It also brings you inside Goldman's mind as he attempts to create a solution to one of the biggest problems currently facing goalie development in the United States – a lack of a goalie coaching certification program. Interviews in "Between Two Worlds" include the following: Jukka Ropponen (Founder of GoaliePro and one of Finland's most tenured goalie coaches), Hannu Nykvist (Director of Goalie Development for the Finnish Hockey Federation), Thomas Magnusson (Director of Goalie Development for the Swedish Ice Hockey Federation), Mitch Korn (Goalie Coach for the Washington Capitals), Corey Hirsch (Hockey Canada Goaltending Advisory Board), Jack Hartigan (Founder of FinnGoalie), Eli Wilson (Founder of Eli Wilson Goaltending), and many more.